Featuring a high magnification ratio of 12x, Lens Shift Image Stabilization and a Powered IS function, Canon's 12x32 IS binoculars are perfect for bringing details up close while providing an impressively steady image. Whether you're bringing distant landscapes closer, observing baby birds in a nest or watching actors perform from your balcony seat, they deliver a bright, sharp and easily sustainable view. Thanks to an improved, ergonomic design, the 12x32 IS binoculars are easy to bring and comfortable to use even for extended periods of time. They're the ideal solution when you want to have a pair of versatile, excellent binoculars on hand. Thanks to an excellent optical system, Canon's 12x32 IS binoculars can deliver impressive performance and a stunning, close-up view through a high magnification ratio of 12x. This makes it easy to see details and action that would likely be missed with the naked eye. From the intricate feathers of a bird on a branch, to the expression on the face of a graduating student or the ball flying out of the ballpark, what you want to see can be brought closer with the 12x32 IS binoculars. The 12x32 IS binoculars feature a powerful Lens Shift Image Stabilization system that's remarkably effective in cancelling out possible shaking made by movement and vibration. Borrowing technology from Canon's EF lenses, Lens Shift Image Stabilization maintains a steady view by incorporating a continually adjusting vibration gyro mechanism, moving the IS lens both vertically and horizontally. This helps the 12x32 IS binoculars deliver clear and sharp images with minimal colour fringing for a view that's consistently pleasing to look at. 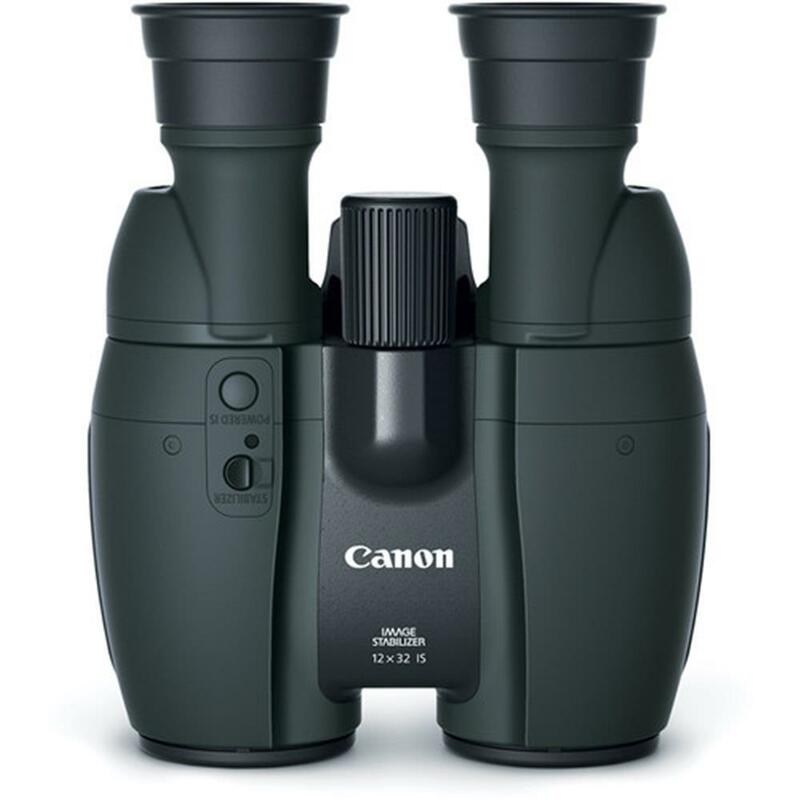 Originating from Canon's high-quality video and digital camera technology, the 12x32 IS binoculars' Powered IS technology significantly improves upon conventional binocular IS technology. Activated with the press of a button, Powered IS makes it easy to maintain a high-magnification view, especially in situations where body movement or strong shake might occur. Toggle between Powered IS and Normal IS to pick the ideal mode for the scene, whether your subject is still or in motion. Not only does the incorporation of Lens Shift Image Stabilization improve optical performance, but it also has the added benefit of making the 12x32 IS binoculars easy and comfortable to hold. Through the miniaturization of the IS unit the binoculars provide an ergonomic and sturdy grip, allowing quick, intuitive access to the IS switch, focusing ring diopter and more, with ease. For edge-to-edge sharpness, the 12x32 IS binoculars use a field flattening lens element. Countering the blurred effect typically rendered by the curvature of conventional lens elements, field flattener lenses help deliver a sharp, low-distortion image across the entire field of view. To suppress colour bias, lens flare and ghosting as well as render a sharp view with contrast, the 12x32 IS binoculars incorporate Super Spectra Coating on its lenses. This coating effectively suppresses reflected light across a wide range of wavelengths, resulting in high contrast, high definition and a clear viewing experience. 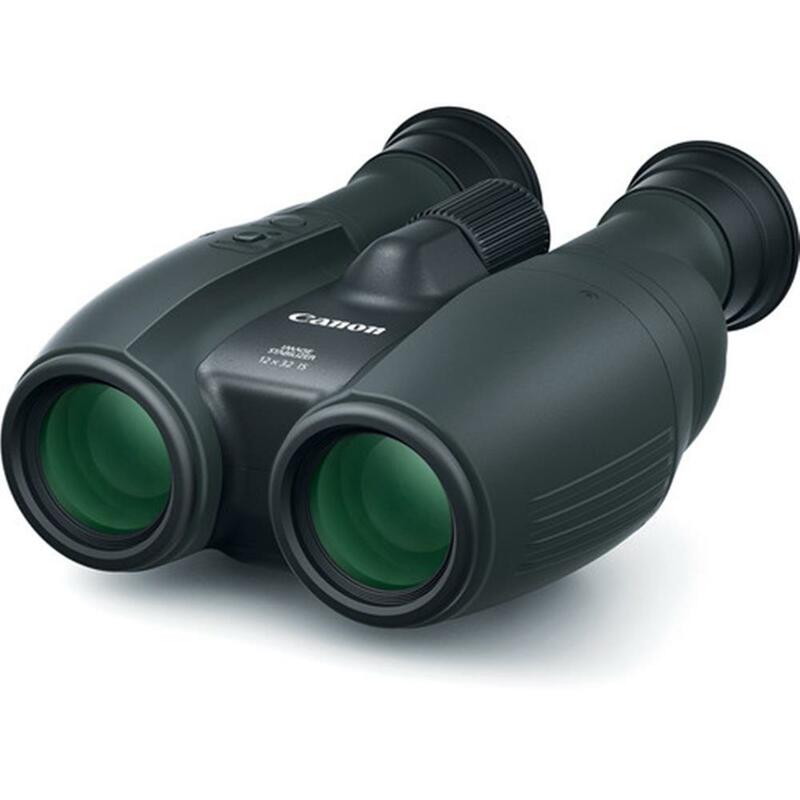 A notable reduction over previous models, the 12x32 IS binoculars feature a minimum focusing distance of 6.6 ft. (2m) ideal for viewing animals, flowers and other small objects from a short distance. Combined with the 12x magnification ratio, it's easy to see even the smallest details with the 12x32 IS binoculars.